Mayor Stephanie Rawlings-Blake from her Facebook page. Baltimore Mayor Stephanie Rawlings-Blake’s retirement announcement last week turns next April’s city election into a free-for-all among a group of imperfect, little-known or inexperienced candidates. It reveals the reality of Baltimore’s sorry class of politicians. There are no lions in this crowd, no movers-and-shakers. Few have much elective experience. Few possess the necessary management skills for running a complex, $2 billion organization. So far, no one on the list of putative or announced candidates has shown the sort of leadership charisma Baltimore sorely needs. Rawlings-Blake will be remembered more positively by historians than she is today. Her once bright political career lies in shambles, the result of a series of poor decisions and her laid-back demeanor during April’s civil unrest. She’s not the first Baltimore mayor to lose her appetite for Baltimore’s top elective office following days of destructive rioting, looting and arson. Thomas J. D’Alesandro III, from an illustrious political family, gave up a bright future after one term as mayor. He was burned out emotionally and physically by the strains of the 1968 conflagration after the assassination of Martin Luther King — and the massive effort required to restore order, rebuild and convince citizens that Baltimore had a bright future. It was left to William Donald Schaefer to take on that monumental task, which he did brilliantly. Rawlings-Blake was too cerebral (much like former Mayor Kurt Schmoke) and too deliberative to deal effectively with a terrible crime wave and civil unrest that required quick, firm decisions and public assertiveness. She botched one key element of her job, public safety, by forcing into retirement a popular and successful police commissioner (Fred Bealefeld), replacing him with a West Coast outsider who never hit it off with the community or rank-and-file, and then turning Anthony Batts into a scapegoat following her administration’s botched handling of disorder in West Baltimore. She trusted only a handful of intimates with policy decisions, blocking the kind of broad networking and communications good CEOs need. She exhibited a coolness and unapproachability in a job that cries out for the opposite. Her calm, dispassionate demeanor came across as uncaring. She never struck the right chord with Baltimore’s citizens or with the business community. She lacked outward warmth, humor and emotion — three essential elements for successful leadership. Nevertheless, she was an excellent fiscal steward for Baltimore. Much like her father, Rawlings-Blake knows how to dissect a budget and take steps to get government’s financial house in order. She negotiated a long-term deal with the state to embark on a $1 billion, long-overdue school-building and renovation program. She sharply lowered teen pregnancies and recruited a highly regarded health officer. She had the guts to implement pension reforms that threatened to bankrupt the city. She cut property taxes. She halved the city’s structural deficit. Rawlings-Blake made the right choice in declaring she will not run for reelection. Restoring Baltimore’s equilibrium between now and the time she leaves office late in 2016 won’t be easy, especially with more unrest looming if the results of police jury trials displease local hotheads. Concentrating on getting reelected instead of the nitty-gritty of governing would have been irresponsible. It is one of the curses of America’s electoral system that incumbents are asked to do the impossible — govern and campaign simultaneously. You can do one or the other well, but not both. 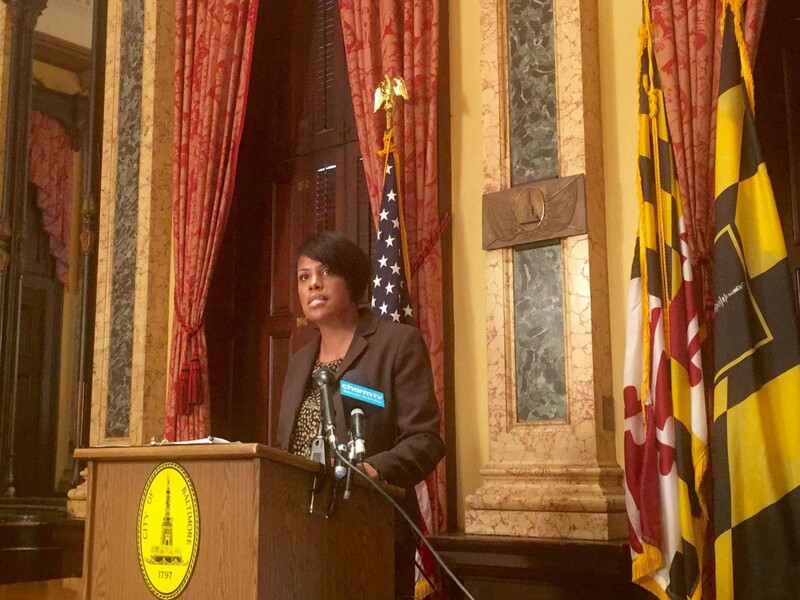 Rawlings-Blake now can focus her undivided attention on the needs of Baltimore as it tries to pick up the shattered pieces of progress after April’s disturbances. It was a logical and thoughtful move that placed her personal political desires on the shelf. The mayor deserves applause: The city will have a full-time mayor for the next 15 months. But who will succeed Rawlings-Blake? So far, the list of candidates and potential candidates is depressingly unimpressive. Former Mayor Sheila Dixon has the management experience to run the city in a highly effective manner. She is dogged, though, by her theft conviction of gift cards for the poor and homeless. Still, she is one of the few people in the race who has run citywide, has a broad-based organization and name recognition. Carl Stokes is a seasoned city councilman who has run for mayor before, but his too-obvious ambition may turn off voters. Cathy Pugh is a shy state senator and former councilwoman who has done solid work in Annapolis but lacks an appealing, outgoing personality. Nick Mosby is only in his freshman term as a councilman and is married to the most polarizing figure in Baltimore. There’s not a bona fide lion in the bunch. Baltimore used to have plenty of political heavyweights but these days the list has dwindled. Barbara Mikulski is retiring. Martin O’Malley is quixotically running for president. Elijah Cummings is ensconced as a powerful voice for African Americans on Capitol Hill. Kweisi Mfume, the former congressman, hasn’t shown any previous interest in becoming mayor. Perhaps someone will emerge with strong backing from the legal or business communities, much as Schmoke did when he came out of nowhere to defeat an incumbent state’s attorney. Perhaps Mfume will look seriously about running for mayor this time. At the moment, though, the list of contenders is far from impressive. The next mayor faces a daunting challenge. Baltimore is a poor city with huge, unmet needs. It is the last refuge for the region’s underclass — the homeless, the unemployed, the dispossessed. Much of the city’s former middle class now lives in the suburbs. A conservative governor in Annapolis shows little desire to make Baltimore’s needs his priority. It’s a bleak picture. Whichever candidate voters select had better be up to this Herculean task. CAMBRIDGE: I’m down in Cambridge on the Choptank, sitting in my cheap hotel room about ready to head out to the Hyatt for the annual winter meeting of the Maryland Association of Counties. The governor will speak to the elected and appointed county officials after dinner, as all governors do every year.